With the annual jamboree of the Turner Prize visiting Glasgow at present a few national newspapers have done "What to see in Glasgow" sections, which have been a wee bit on the unimaginative side I have to say. So I wanted to have a quick run around some of the galleries in Glasgow that I like to visit in order to encourage other people to go and have a wee look at them from time to time. As attractions go these Glasgow galleries generally have the advantage of regularly changing their exhibits, so that if there is nothing that you fancy when you visit, there'll be another one along soon. Also they are usually absolutely free to visit. Glasgow has established a reputation for being home to some of the best and most imaginative contemporary artists in Britain, often referred to as the "Glasgow miracle". The galleries in the city, and their visitors, have been an important part of that. Anybody wanting to find art in Glasgow should start at Kelvingrove Art Gallery and Museum . Alasdair Gray often talks about his childhood visits here starting him on his road to becoming an artist and like many people I can remember being brought here with my school class and being asked to pick an exhibit from the galleries and draw it for their regular competitions. The museum lies on Dumbarton Road in the west end of Glasgow. Opened in 1901 as The Palace of Fine Arts for the Glasgow International Exhibition of that year it has been an integral part of the city ever since It is where my great-uncle Andy who worked in the shipyards liked to take my mum for a day out and where I have spent many days with my own children. I really don't visit it as often as I used to since it re-opened after refurbishment in 2002, I knew the dusty old layout like the back of my hand and felt it lost a bit of character with the revamp. However it remains the most visited museum in the UK outside of London, a great advert for free entry to museums. As well as an impressive collection of French impressionists' paintings and Dutch and Flemish art there is a large collection of Scottish art on permanent display. This includes a small selection of works by the Scottish Colourists and a room of works by the Glasgow Boys, a loose alliance of about 20 artists from the 1880s. However many people come specifically to see one painting, Salvador Dali's Christ of St John's on the Cross. A controversial acquisition in 1952, at one time attacked in protest, it has proven to be a very astute purchase by then director, Tom Honeyman. I presume that any controversy over Dali's depiction of Christ has died down, as when I went to see it last week there was a nun sitting alongside me inspecting it. Downstairs there is a temporary exhibition space, which charges an entry fee, currently for an exhibition on 19th century fashions. Not far from Kelvingrove Art Gallery is found another fine collection of world class paintings. The University of Glasgow is home to the Hunterian, one of Scotland's oldest public museums, founded in 1908. The collection is currently displayed on two separate sites within the university, although part of it will soon be moving to a new space in nearby Kelvin Hall (opening summer 2016). It was founded with a bequest from 18th century anatomist Dr William Hunter and has many artifacts collected by him on display in the museum, which is housed in the main university building. Across University Avenue in a modern building beneath the high towers of the University Library is The Hunterian Art Gallery. Behind the large metal doors designed by Eduardo Paolozzi are paintings from the likes of Rubens and Rembrandt. The Glasgow Boys and Joan Eardley are well represented and there is a fabulous selection of works from the Scottish Colourists. This includes one of my favourite pictures in the world, Les Eus by JD Fergusson, a huge and joy-filled canvas painted about the same time as Matisse's Dance. Other highlights here are the extensive collection of works by James Abbott McNeill Whistler and by Charles Rennie Mackintosh, the latter of which are on display in a recreation of his (now demolished) nearby house. There are also rotating temporary exhibitions here (currently on animals in the art of George Stubbs and others). In the upper floor there is another temporary exhibition space which houses an ever changing selection of displays which sometimes incur an entry fee, although the current one on Scottish archaeology is free. A lesser known gallery space in nearby Park Circus is The Common Guild. Home to a visual arts organisation you can browse through the art books in their library whilst visiting their exhibitions. They use the ground floor and first floor of a handsome Victorian town house as gallery space, usually open from Wednesdays to Sundays. Until 13th December they have an exhibition by German artist Thomas Demand called "Daily Show". As so many people record all sorts of images day to day, on phone cameras he has used a mobile phone camera to record undramatic scenes from daily life and produced large prints of them, from missing roof tiles in an office to clothes pegs on a line. As a camera phone addict myself I enjoyed seeing his take on this sort of thing. I must try harder with my efforts. The next galleries are all housed in one block in the city centre at Trongate103. At the corner of Trongate and King Street can be found a building where you can see, amongst other things, the fantastical junk sculptures of Sharmanka Kinetic Theatre (makers of the big mechanical clock in the National Gallery of Scotland in Edinburgh), the gallery space of Project Ability, a visual arts workshop for people with learning difficulties and the Glasgow Print Studio. Here a diverse and constantly changing range of exhibitions make it a place worth coming back to again and again. Having just finished with an exhibition of comicbook art from the world of Mark Millar, they now have on upstairs an exhibition of etchings and monotypes by Ken Currie (until 18th October). He became known as one of the "New Glasgow Boys" along with fellow 1980s Glasgow Art School trained Adrian Wisniewski, Steven Campbell and Peter Howson. There is a lot of death and darkness on show in Ken Currrie's prints, and known for portrait painting his portraits stand out in the exhibition. Amongst images of dead birds from North Uist I did like this one above of "Dead Finches, Kelvingrove" showing that the days of my primary school trips to draw from the Kelvingrove displays live on in this 2015 etching. Iranian born Jila Peacock's paintings downstairs depicting scenes from the medieval Persian poem The Conference of the Birds were a colourful contrast to what's going on upstairs. Loved them. Also housed here at Trongate103 is Transmission Gallery. This gallery is often cited as one of the reasons the Glasgow art scene has blossomed in recent decades. Set up in 1983 by Glasgow Art School graduates it aims to encourage, support and exhibit young artists. If you are walking down to get a mushroom burger and some music at Mono, you might be tempted in by some strange offering in the big windows here. At present it looks like they are clearing up between exhibitions or from a Transmission party. Next door to Transmission gallery is found Street Level Photoworks, a gallery for local and international art photography. Their current exhibition Surface Tension (until 8th November) shows the work of four artists. I was attracted to the pictures by Karen L Vaughan of east coast fishing villages from Angus to Pittenweem, presented as fragmentary panoramas. Just around the corner from the Tron Theatre on Osborne Street is The Modern Institute which presents a very varied selection of exhibitions from artists which they represent. Currently their ground floor exhibition space is showing works by Merseyside born Michael Wilkinson called Sorry Had To Done. As well as there being plenty of visual fun here, there were pieces that left me stroking my beard in contemplation. I liked the fluorescent strip light bulbs bound together as "fasces" and the huge tower of Lego beside "Dream a Garden", a pile of concrete rubble from a recently demolished tower block in the east end of Glasgow arranged into a neat rectangle. A former tower block resident myself I've watched my childhood home of grey concrete be reduced to rubble recently. I liked the whole range of ideas the title triggered off. The Modern Institute have another space across the road from the Briggait on Aird's Lane. 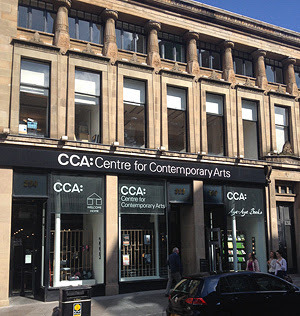 The Centre For Contemporary Arts (CCA) on Sauchiehall Street occupies an old 'Greek' Thomson building and has exhibition space, a cinema, music venues, a vegetarian cafe, a bookshop and arty gift shop. It has been home to the Glasgow avant-garde since the 1970s when it was called the Third Eye Centre. In the late 70s my mum worked in the cafe whilst she was at college. During the school holidays their laid back approach to childcare meant that my brother and me spent a lot of time there when my mum was working: refilling the filter coffee machine, changing the big boxes in the milk fridge or just playing in the gallery spaces. It wasn't me that kicked over the lines of sawdust we didn't realise were an exhibition (that may have been my wee brother). The current exhibition The Shock of Victory is a sad/ironic look at the world exactly a year after the Scottish independence referendum, including building an archive from the campaign. It is as unusual as you would expect from an exhibition here, but benefits from the viewer spending a bit of time reading the ideas behind the pieces. Symposia, talks and films run alongside the exhibition. Lovely place to have a beer, a coffee or a lunch. When The Gallery of Modern Art Glasgow opened in the Royal Exchange Square in 1996 Douglas Gordon that year became the first Scottish artist to win the Turner Prize. Yet the modern Scottish artists of the time, who were successfully exhibiting their works around the world had any works on display in this gallery of modern art. No longer. With the Turner Prize exhibition visiting the city at present at the Tramway, the main hall of the gallery is at present given over to an exhibition of works made in the city since that time. Over twenty artists, including several former winners or nominees for the Turner Prize are on show, starting with the neon signs outside, by Ross Sinclair. I am glad to see such a comprehensive exhibition being put on, whilst some of the space in the museum is closed off for renovation. David Shrigley has some animations on show, paintings and sculptures by Martin Boyce, Toby Paterson Jim Lambie and others fill the hall. Upstairs there are exhibitions worth seeing including rarely seen works from the Glasgow Museums archive chosen by modern artists, including a lovely oil painting by Walter Sickert and a painting by Bridget Riley. On the top floor woman in art are highlighted in an engaging exhibition in collaboration with the Glasgow Women's Library. On the banks of the Forth and Clyde Canal lies The Whisky Bond building, now home to numerous studio spaces and the Glasgow Sculpture Studios. Their gallery on the ground floor is open Wednesday to Saturday, making it a wee place to stop off at on your way to get some shopping at SeeWoo or on your walk along the canal to see Partick Thistle. Currently they have some work by Nicolas Deshayes, Darling, Gutter, expanded foam around the hot water pipes of the room, making these blobby shapes also functioning radiators as it were. Okay, last but not least, I made it to the Tramway where the current Turner Prize exhibition is displayed. Originally a tram shed built in 1893 the building was made into the Glasgow Transport Musuem in the 1960s when Glasgow decided that trams were the transport of the past (Doh!). As my granny lived in Mosspark we came here regularly to see the vehicles that are now housed in the modern Riverside Museum designed by Zaha Hadid. Since 1988 this old industrial building has been an arts venue and now also home to Scottish Ballet. The main hall at the Tramway has been broken up into large white cubes where the four nominees for this years prize show their stuff. There is a long and illustrious list of past winners and nominees on one wall of the exhibition, from Gilbert and George to Antony Gormley, Damien Hirst and Rachel Whiteread. Then Scottish based artists start to feature regularly like Martin Boyce who won in 2011 and David Shrigley and Ciara Phillips nominated in recent years. Ironically in the year the show is in Glasgow no locals are represented. I arrived at the Tramway today a bit hungry and the food I got in the cafe was, to say the least, disappointing so I may have looked around the exhibition in a bit of a bad mood. However the exhibition didn't really lift my spirits much. Nicole Wermers spoke of people claiming public space for themselves by putting a coat on a chair, when I would have thought it is usually just that it would be otherwise too hot or a case of dumping it on the floor. To illustrate it with pelts of dead animals stripped of their coats just annoyed me. Then nothing winds me up more than people going on about the paranormal, so a roomful of it from Bonnie Camplin was never going to be for me. Janice Kerbel has some unaccompanied opera singers reciting her words, something I've seen Richard Youngs producing more effectively recently at Counterflows festival in Glasgow without a nomination for an art prize. The final display is of a showroom/workshop of the Assemble collective about their work in working with a Liverpool housing re-development. As a visual spectacle the Turner exhibition is a bit earnest and the logo emblazoned everywhere "Show Me Some Thing New" feels a bit at odds with the actual exhibits. There are plenty of new, innovative, imaginative, thoughtful, fun, interesting exhibitions on in Glasgow just now. I haven't included some galleries which I didn't get to, or which didn't have an exhibition on the days this week I was wandering about such as the Collins Gallery, The Pipe Factory or David Dale Gallery. So go beyond the Turner exhibition to see if you can spot next year's nominees.